Want to get some free stuff? How about some bling? 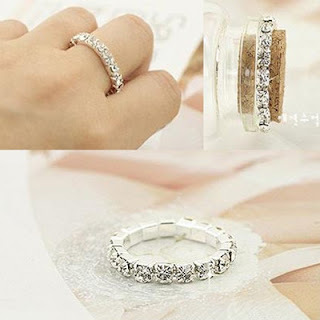 Born Pretty is giving away 1000 elastic rhinestone rings. Become a fan of their Facebook page, share the news, and use the coupon code to get the freebie. Read all the instructions here. While you're there, take a look at their other nail products. They've got a pretty amazing inventory of nail supplies, and I'll be teaming up with them soon to provide some reviews of a few of their products. You'll find this code available in my sidebar from now on, so don't feel bad about using it more than once. With enough entries for the coupon code, there may be a sponsored giveaway in the future! Thanks for the share! Do you know how much it costs for S/H?